Goal-Shooter Chelsea Lewis at full stretch for Celtic Dragons against London Pulse. Pic: Marc Morris. 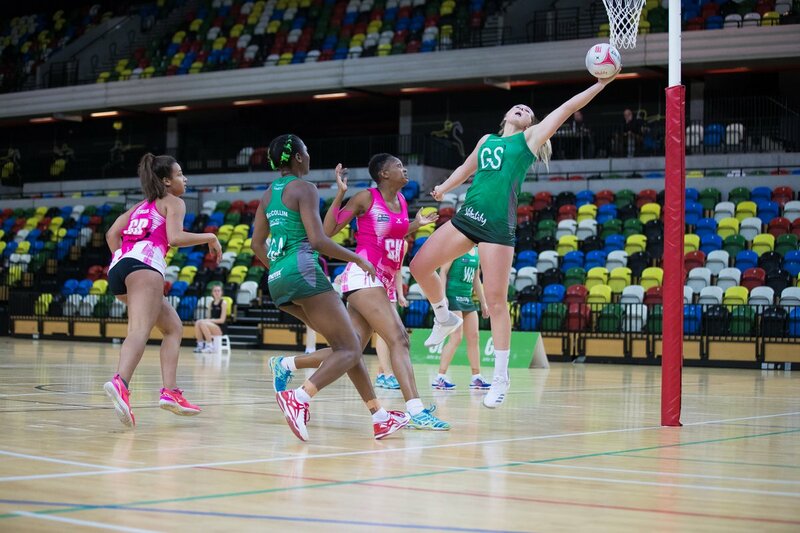 Tania Hoffman believes the Celtic Dragons are reaping the rewards of their fresh start as they claimed their first home victory of the season. The Dragons coach watched her team beat London Pulse 62-51 at the Sport Wales National Centre on Monday night – their fourth victory of the season. It means in little more than half a campaign, Hoffman’s side have earned as many wins as they did in the previous two years – a measure of the progress they have made in what the New Zealander has claimed was almost a complete rebuilding programme. “It was almost like a new franchise,” said Hoffman after the win over the league’s actual new franchise. “It’s a new coach, lots of new players this season, so it’s a time to be able to challenge ourselves and head into a new era. “Our culture, our team culture, is fantastic and I couldn’t expect more from the team. One of the things [that needed to change when I arrived] is belief because Dragons haven’t had a lot of success over the years. “It was finding that belief that they can win games and not just win games against similar opposition, but actually against teams from the top four. Hoffman’s arrival in August of last year marked a break from the past as her brief was to concentrate solely on improving matters for the Dragons, rather than combining the role with coaching the Wales national team as previous incumbents had done. The result has been a more singular purpose around the club, with the international link untangled and players expected to concentrate solely on impressing their coach for domestic reasons. Coupled with the arrival of new players, such as Jamaican international Stacian Facey – a tower of strength against Pulse – and the re-signing of others such as Kalifa McCollin and Chelsea Lewis, the Dragons have far fewer weak links than in previous years. The Dragons were always in control against Pulse, showing greater accuracy and a physical edge to eke out a 26-21 lead at the halfway stage. They had a wobble as Pulse drew back to 37-33 with three-and-a-half minutes to play in the third quarter. But a vital final two minutes saw the home side wrestle the momentum back and finish it with five unanswered goals and that delivered a 44-35 cushion at the end of the third quarter. The Dragons kept the scoreboard ticking over in the final quarter to make sure things didn’t slip as they completed a Vitality Superleague double over their London opponents. “I’m pleased, but it wasn’t a complete performance,” added Hoffman, whose team were backed by a large and noisy home following, swelled by dozens of young fans from Rhondda Netball. The Dragons now have another home fixture against Severn Stars on Saturday – and a chance for revenge for their 57-40 defeat in January. “Last time we played Stars, we had quite a big loss so we want to put things right at home,” added Hoffman.